I eat this stuff up, I really do. Going to conferences is always a great way to get back in touch with creativity; both technically and artistically. So far I have sat in on classes about creative composites, Illustrator Down & Dirty Tricks, Exploring 3D in Photoshop, and Exploring HDR. Good stuff, coming from a plethora of experienced, photographers eager to share their skills with a truck-load of folks who are just there to sponge. The expo is super cool too, and I finally got to see a Lensbaby and play with it – so I bought one! 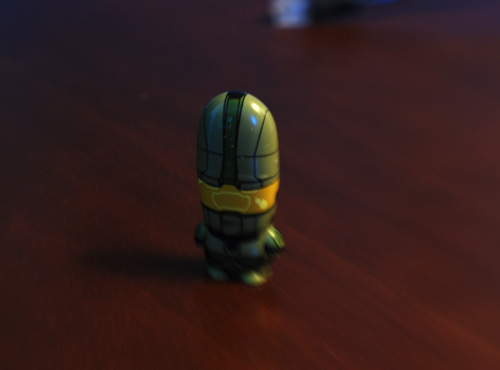 These things are freakin’ cool, and Master Chief here was taken with it quickly on the desk in my room, which by the way is a Mimobot Thumb Drive. They really pulled off a good update with the new composer. It has a lens interchange system as well as the ability to put a wide angle and telephoto adapter on it. Pretty cool. I will be getting out tomorrow sometime to shoot with it around the hotel. If I wasn’t such an ijit, I would have taken it with me to the party tonight. hold the <CTRL> or <CMD> key to temporarily disable the snap while resizing. <CTRL> + E key will merge visible layers but not flatten them. <CTRL> + <ENTER> will create a selection from the selected path. There are something like 240 quick key commands, so this is only the icing – but these are good ones. It sounds like you’re having fun. I wish I was in Boston! Have you made it to the Square yet?